Sea-Tac International Airport is the major airport serving Washington State. 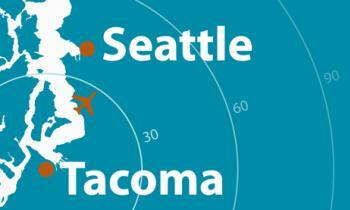 Tacoma is just 18 miles south of the Sea-Tac International Airport with easy access from Interstate-5. Visit Sea-Tac International Airport for information on parking, airlines and passenger services. From the north via Interstate-5: Take Interstate-5 to exit 154 B and drive west on State Route 518 to the Sea-Tac International Airport exit. From the north via State Highway 99: Take 99 south. At the First Avenue Bridge stay right and follow State Route 509 south to State Route 518 exit [Burien, Sea-Tac Airport]. Turn left onto 518 and take the Sea-Tac International Airport exit. From the south: Take Interstate-5 to exit 154 and drive west on State Route 518 to the Sea-Tac International Airport exit. From the east: Take Interstate-405, which turns into State Route 518, to the Sea-Tac International Airport exit. TSA Precheck lane availability is posted for Sea-Tac, so enter your dates of travel here to see if the lanes will be open. And if you’re not already enrolled in TSA Precheck, you can enroll at Sea-Tac or any of the other nearly 400 enrollment centers in the US. Learn more and apply here. The Port of Seattle also offers discounts on airport parking on their site.